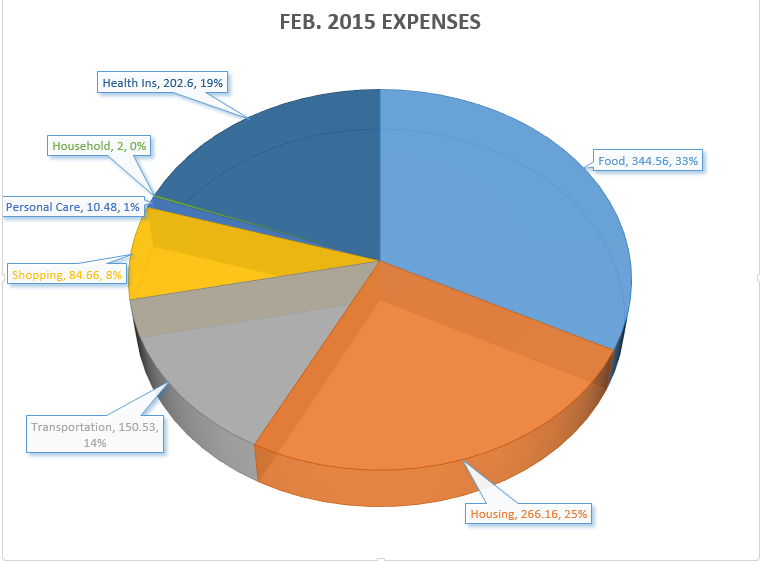 Reporting my expenses here has definitely helped bring more consistency in tracking my expenses. As I mentioned before, I slacked off a bit last year in tracking personal expenses when I started working for myself in the summer of last year. The goal wasn’t so much about setting out to change my spending habits, although I would love to see my “food” expenses reduced, but to have hard numbers based on the way I live so that I can properly plan for how to cover those expenses when I no longer have to work.For the most part there hasn’t been any surprises in my spending so far and most of the areas I do spend money on stay within a fairly predictable range. 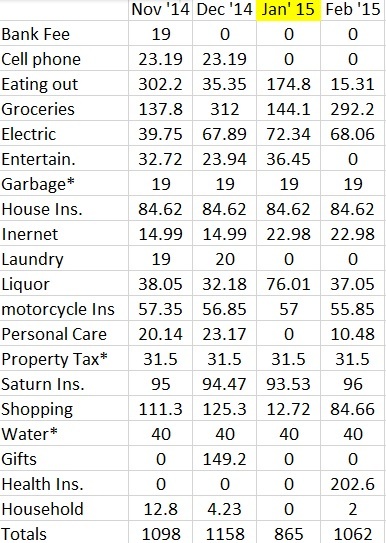 There will be infrequent expenses that occur at a fairly predictable rate, things like property taxes, medical expenses, and travel that may push me over the $13k mark I have predicted my spending to be this year, but the truth is that it’s the routine monthly expenses that really “cost” you. Things like utility bills, cell phone plans, and internet/T.V. and food. These are services that will likely be used throughout one’s life, month in and month out for years. They don’t seem like much on a monthly basis, especially if you can “afford” it, but they really create a drag on liberating money for other things that are truly valued. Awesome once again. Sub-$1,100 even with health insurance. Mighty impressive, my friend! I’d love to get down to somewhere around $1,500 reliably once again for personal expenses. I think if I get rid of the car, it’s definitely possible. The engagement ring amortization will be done soon as well. Food is also my Achilles Heel. I don’t mind, though. I think that food is one of those quality of life things that’s difficult to scrimp too much on for too long, and I’ve certainly done my fair share of scrimping in that department. I still eat my fair share of PB&J sandwiches, but the occasional shrimp pasta here and takeout Chinese there quickly increases the overall food expenses. Thanks DM. Since I commented over at your place I’m not going to say much more here other than thanks for stopping by! 🙂 And for my readers, go visit DM post today on the freedom fund and you can see my comment to Jason there. He has a great site and was a huge inspiration when I took those first fledgling steps to get my financial house in order a few years ago. Did you quit your blog? Hope everything is ok with you! Nope. I’m still around. I a bit of a seasonal blogger. With this being my first “season” of self-employment I’ve stayed rather busy since mid-March. I’ll be back soon and if the market keeps acting the way it has over the last few days, perhaps sooner rather than later. Thanks for checking on me!